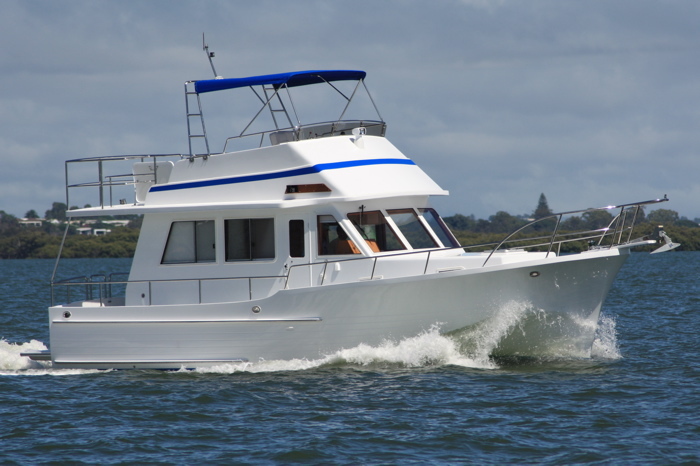 Maritime Coastal Cruisers will launch in Australia the Coastal Gypsy 36 at Sanctuary Cove. The 36 is the smallest vessel in the range at 12.6m with a beam of 4.05m and a draft of 1.33m and it offers an economical cruising capability for a couple or family. This new trawler-style flybridge coastal cruiser offers long-range and economical performance with a single Cummins 6B220 Diamond Series diesel, 220hp, engine. It features dual-helm stations and bow thruster for ease of handling. The Coastal Gypsy 36 has walk-around side decks and a generous cockpit. Accommodation includes a master suite forward with island bed and a port-side guest cabin. There is a starboard bathroom with electric toilet and hot and cold shower. The vessel has a 700L fuel capacity and 400L water capacity. It is constructed with hand-laid fiberglass and is made by Poly Marine China. Poly Marine also manufactured a number of the Norman Wright Navigator series. The exhibitor intends to bring a Coastal Gypsy 40 into Australia later this year.